As today is Valentine’s Day and red roses abound I thought I’d tell you about Lancashire’s red rose – the symbol of the county for hundreds of years. 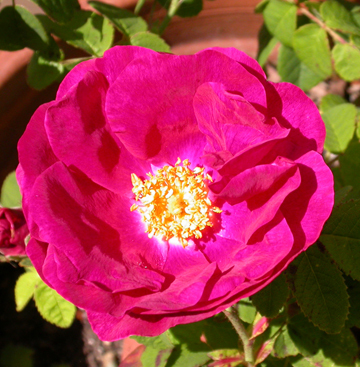 The Lancashire rose is rosa gallica officinalis and is more commonly known as the Apothecary Rose. In 19th century France this rose was a common sight outside the apothecary’s workshop. It is an ancient variety of rose which originated in Persia where it grew wild and it’s thought to have been brought to Europe by returning Crusaders during the 12th and 13th centuries. Edmund, first earl of Lancaster, who was also known as ‘crouchback’ probably because of the Crusader’s cross he wore, may well have brought the plant back to England when he decided to use it as his emblem. It was grown by monks for its medicinal properties, being used to cure a diverse range of ailments from gout to stomach upsets, sore throats, skin rashes and eye problems. Ladies rubbed their skin with rose petals to banish wrinkles and it was later proven that roses contained essential oils, potassium and iron. The rosehips are packed with vitamin C – how many of you remember rosehip syrup on school semolina puddings? The rose was also grown for its perfume. The highly fragrant petals were used in pot pourri to scent medieval chambers and this variety of rose is still used for fragrances and cosmetics. Rosa gallica officinalis is a small shrub rose, growing to around 4 feet in height (just over a metre) with crimson petals and prominent yellow anthers. It is a vigorous plant and is easy to grow. It can be seen in the herbaceous border near the Shire Hall entrance to Lancaster Castle, at Pendle Heritage Gardens in Barrowford, near the Ashton Memorial in Williamson Park at Lancaster, and at Levens Hall. In religious symbolism the deep red of the Lancashire rose was used to represent the blood of Christ and other martyrs. Its petals were dried and rolled into beads that were strung together to form a rosary. 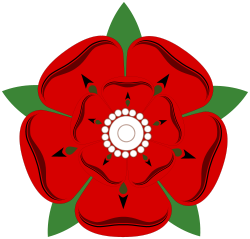 The stylised image of the Lancashire rose has five petals each separated by a sepal. It is depicted with two petals at the top, although the white Yorkshire rose is the other way up with a single petal at the top. 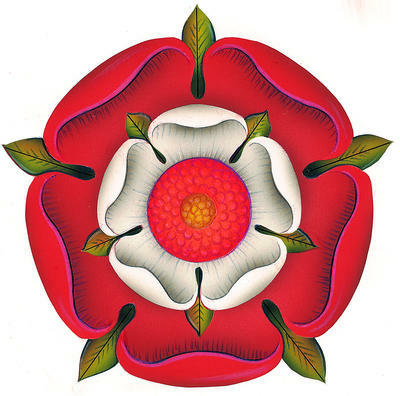 The Tudor rose is a combination of the two with a larger red rose to show the supremacy of the house of Lancaster over the house of York.